Published on Friday, October 6, 2017. This article appears in the October/November 2017 issue of American Craft Magazine. 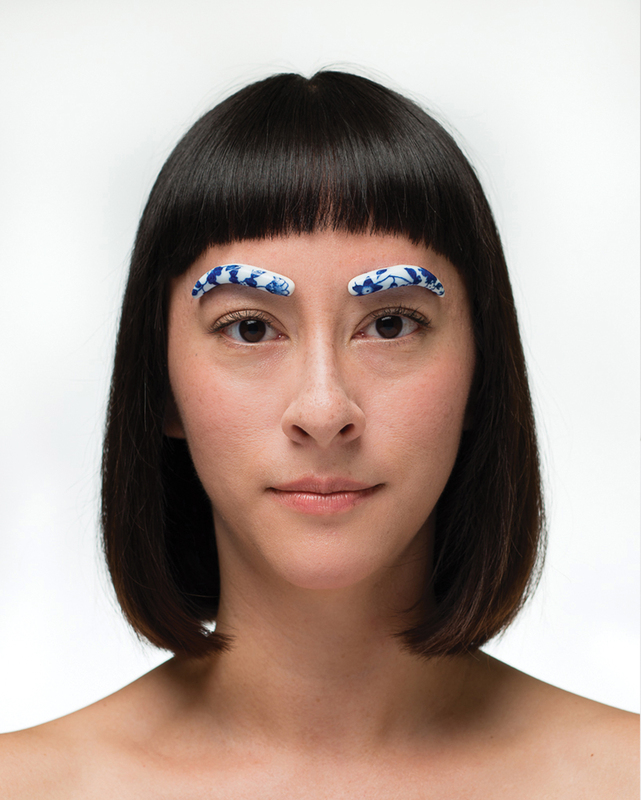 Emerging Artist Jennifer Ling Datchuk’s eyebrow-raising Blue and White: Elegant Ingénue (2014) highlights notions of cultural appropriation and identity. We are pleased to announce the 2017 Emerging Voices artist and scholar, as well as our shortlist artists. The American Craft Council established the Awards in 2015 to recognize and celebrate the talents of remarkable young makers who contribute to craft with their hands, minds, and creative spirits. Jurors Karen Hampton, Jiseon Lee Isbara, Michael Radyk, and T’ai Smith chose from a pool of candidates within five years of significant training. It is our pleasure to introduce you to these five outstanding artists and distinguished scholar. She’s also interested in how these signals can be manipulated. Hairstyles are easily created, she says, and they allow people to fashion their identities according to various norms. “I am interested in exploring the global migration of beauty standards with a discussion of cultural appropriation, appreciation, and reappropriation,” she says. 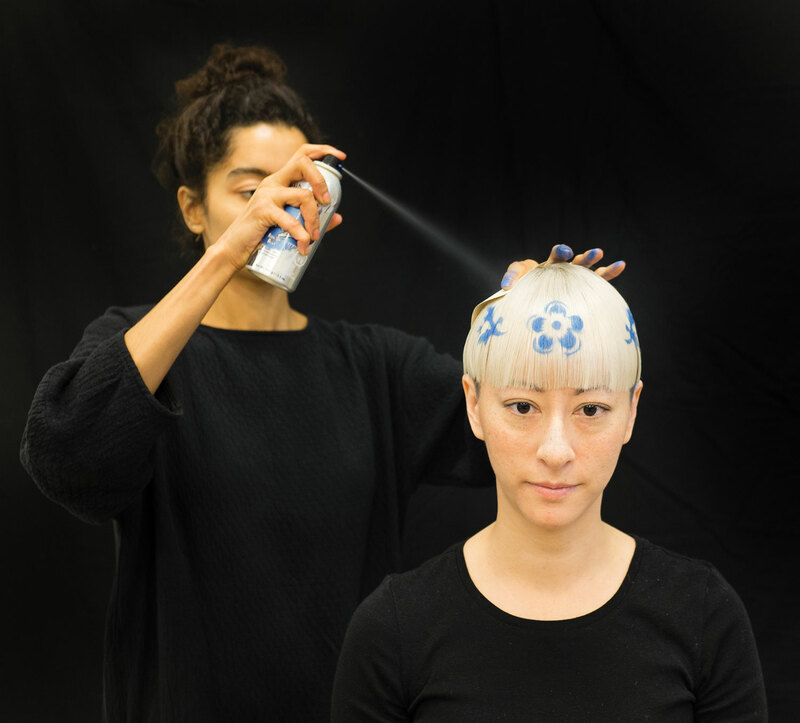 This global migration mirrors the movement of blue-and-white porcelain from a traditional Chinese craft to a style imitated across the globe without attribution – something she explores in her 2016 series Blackwork, which features photos of Datchuk donning various wigs next to ceramics covered in lifted blue-and- white transfer patterns. Datchuk’s work continues to evolve. In August, she wrapped up a residency at the European Ceramic Work Centre in the Netherlands, where she 3D-scanned her body and memorialized scars from two surgeries in porcelain shards. The process was inspired by kintsugi, a Japanese pottery tradition that repairs broken ceramics by filling their cracks with gold or other precious metals, highlighting the imperfections. What are you most excited about in your work right now? Learning how to weave and how I will incorporate textiles with my porcelain work. 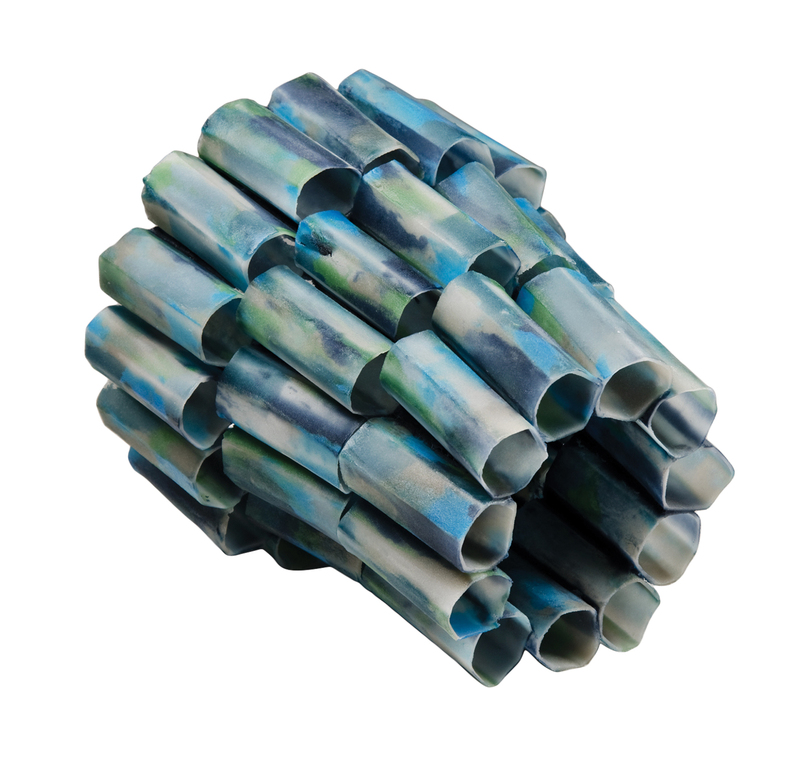 I have been gathering Asian hair, bleaching it blond, and dyeing it a shade of cobalt blue – and buying blue Kanekalon fake hair – to create a woven structure that holds porcelain beads. This started an interest in hippie beaded curtains, macramé, and women’s rights movements. I’m thinking about how pottery and textiles are considered women’s craft and hobbies, and how I can create a new way of experiencing blue-and-white decoration. What do you know now that you didn’t when you started? I wish I knew when I first started how to handle the feast and famine of an artistic practice. I know now not to beat myself up over dry periods where I don’t have much to work on, but to let myself enjoy these quiet times to research and allow ideas to ferment. It wasn’t until I gave myself enough time, and the opportunity to fail, that I was able to create my present body of work. I always love the moment when an idea comes to you and it hits you like a spark. Often this happens when I’m in the shower or doing dishes. What is an ongoing challenge? I struggle with time – there’s never enough. I find that part of my brain is now occupied by teaching responsibilities [at Southwest School of Art] and my students’ lives, and along with my personal and family life and my studio and professional practice, I have a very full schedule. I should be super-protective of my studio time, and I am still learning how to do this without feeling guilty about saying no. What are your hopes for the larger craft field? Diversity and inclusion in the craft field are at the forefront of our conversations. Underrepresented artists are entrenched in their communities, and institutions need to be considerate of this. How do we teach aspiring artists to sustain a career when we have an art field that is not reflective of their experiences? Invite them in and make investments in their futures through education, mentorship, dialogue, professional development, and access to opportunities. Working as a research fellow for the Institute of Contemporary Art/Boston’s 2014 exhibition “Fiber: Sculpture 1960 – Present,” Sarah Parrish realized something: Some of the greatest craft innovators were active during the 1960s, yet there was little critical discourse about fiber art during that time. “I had never heard the names Sheila Hicks, Peter Voulkos, or Lenore Tawney until I began working at the ICA in 2012,” says Parrish, 31. “How had I gone through four years of graduate-level art history coursework without encountering such key figures?” Parrish realized she had found her focus – and a new approach. Now, after earning her PhD in contemporary art history from Boston University, Parrish is taking her work to Plymouth State University in New Hampshire as an assistant professor of art history. I’m beginning the process of revising my dissertation, Anthropologies of Fiber: Claire Zeisler, Ed Rossbach, Sheila Hicks, into a book. Books are a new format for me. It’s exciting to think about the transition: How does the audience for these two genres differ? What additional research do I need to conduct? I’m hopeful that teaching at PSU will help me answer some of these questions, because I often find that my students help me acquire a fresh perspective. What is your favorite part of researching and writing? My favorite part of the research stage is building relationships. It’s thrilling to know that every handshake holds the potential to grow into an enduring, symbiotic professional exchange. In contrast, the writing process is much more solitary. The highlights are those “Aha!” moments when I hit on a paragraph, sentence, or word that makes an entire section of text click into place. What is an ongoing challenge you face? My dissertation tackles a contentious topic: cultural appropriation. During the 1960s and 1970s, U.S. fiber artists drew inspiration from African, South American, and Oceanic art. In so doing, they promoted diverse cultural traditions while also taking advantage of these art forms to establish their own professional identities. The challenge is to acknowledge the profound artistic contributions of American fiber artists while refocusing attention on the suppressed cultural traditions that made their innovations possible. What do you want to address in your work? 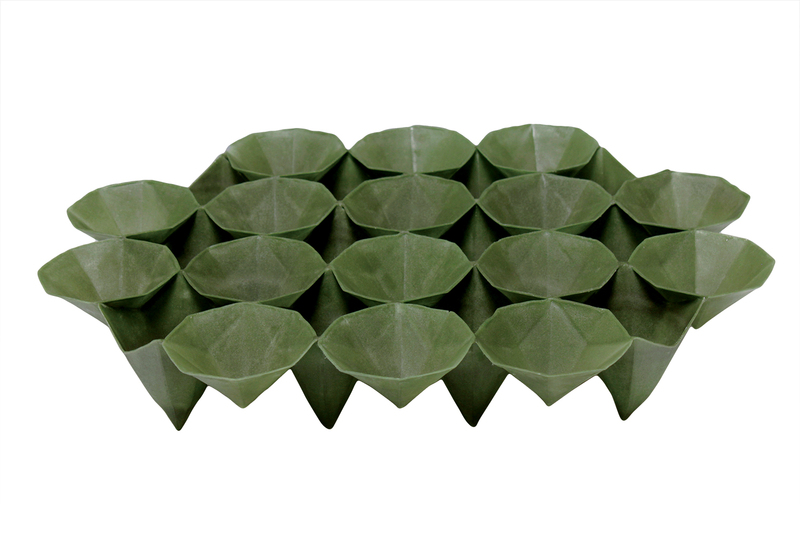 Far more research could be done on how developments in contemporary craft intersect with market trends and collecting practices. Art historians are often reluctant to explore the financial dimension of creative production because it seems to detract from the romantic myth that artists are motivated solely by inner drives. However, a more nuanced understanding of the interplay between craft and finance may help illuminate why certain practices have been promoted while others have been marginalized. Why is fluency in visual communication important? The American school system teaches us to communicate verbally in a very systematic way, from learning our ABCs in kindergarten to writing essays in high school. However, the majority of information we absorb every day is visual and material. To be responsible citizens, it is essential that we become critical viewers. What are your hopes for the craft field? Contemporary craft will benefit from incorporating more diverse perspectives on the basis of race, gender, sexuality, class, and aesthetic. It is necessary to interrogate the economics of the craft industry to ensure diversity among positions of power and influence. It’s encouraging that Jennifer Ling Datchuk was named this year’s Emerging Voices Artist. Her approach offers a productive model for handling difficult issues such as identity and prejudice with verve, humor, and heart. Mlasowsky’s spirit of experimentation has paid off in other ways. A grant from the Glass Art Society in 2014 enabled her to work on an idea for what she calls “moldless pâte de verre.” What started as glass particles mixed into wood glue has grown into a completely new way to work with glass that allows for handforming, building onto an interior scaffolding, or even throwing on a pottery wheel. After three years of refining the technique, Mlasowsky, 32, says, she’s ready to really explore what she can build. I mean – everything, right? You don’t know the material, you don’t know what the possibilities are, and everyone keeps telling you all the things that you can’t do with it. On the way, with every project, with every new question, you discover that there’s so much more possible than what you originally thought. I think what I didn’t know when I started working in glass – and that goes for any material – is that it’s more like a relationship that you enter into, and you really have to get to know each other. You learn more about yourself as you learn more about the material. What are some ongoing challenges you face? It’s a difficult question, because there are a lot of things. This idea of performance-based evaluation – that we get rewarded for results – is what I struggle with most in this field. We don’t get rewarded for failure, and most of what I do is fail and try things out that don’t work. Failing is necessary for progress. Then again, I think I don’t have very much patience; I struggle with myself a lot of times. Also, I have number dyslexia, and calculating, measuring, and math is something I have to do every day – and I need help with it. That handicaps me a lot, that I can’t trust myself and need help with basic things. The excitement comes when things happen that are unexpected, and when there is a discovery – when something happens that I didn’t know about in the beginning and that I didn’t even know I was looking for. Then things start falling into place. Because that’s also where I start getting ideas. I don’t ever set off with a very fixed, solid idea of “This is exactly what I’m going to do, and this is exactly what I make.” I do a lot of experimentation. And through that experimentation, I come to developing ideas. It’s like going on a road trip. Coming home is when it gets terrible; the coming home part is the part when you execute the manual labor to make the piece. It is often less interesting, because less learning is happening. Setting off to something is what excites me. 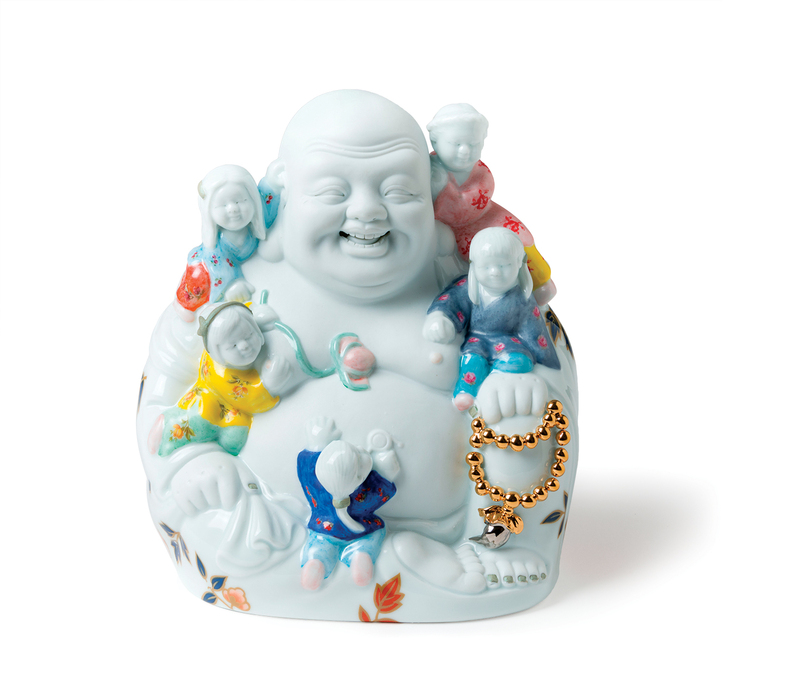 Working with clay has been a dynamic journey with many rewarding surprises. The artistic possibilities are vast. Through my practice, I have met many interesting people from different walks of life who are now part of my artistic family. I didn’t imagine that, more than a decade later, I would be sharing this passion with many talented students [at Long Beach City College]. I am excited about the beauty in the fight that I constantly have with my work; sometimes an idea presents itself at odd hours of the night, giving me a set of new images or promising forms to take to the studio. But hours or days later, those seemingly great ideas have to survive the critical scrutiny of the editing process that sometimes involves a hammer. My work evolves and is propelled in different directions by this critical dialogue, curiosity, and the thirst for the potentiality in new wells of artistic nourishment. What is your favorite part of the process? There are three equally favorite parts of the creation of the work: When the physicality of a form doesn’t need to justify its existence, when an idea or image presents itself with sharp clarity, and when I open the kiln to see the outcome of that relationship. There are only 24 hours in the day. Negotiating the everyday must-do’s and carving out sufficient time to devote to the studio can be a challenge. In the studio, the work dwells in its own relative sense of time, gradually revealing itself through the conversations between perception and translation into the physical. This process has to be natural, and cannot be forced by deadlines or other exterior expectations that are irrelevant to its nature. What is something you want to address in your work but haven’t yet? 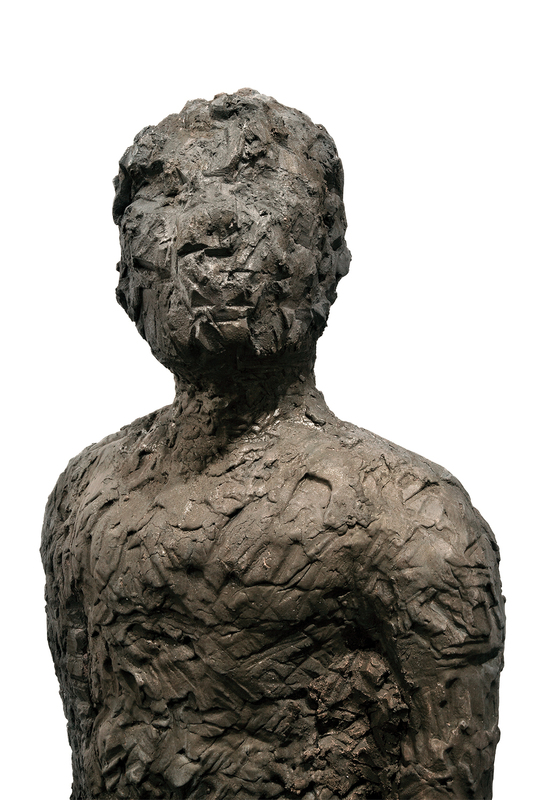 I am planning to create a body of work that allows itself to be more spontaneous, perhaps out of terracotta, so that it can lose its ego, preciousness, and even some self-respect. The process might require additional alcohol throughout its creation, maybe even allowing color to have a major presence in the work. Hannah Batsel’s Out of the Dark/Into the Water, a dos-à-dos book published in 2016, tells a tale of the artist’s grandfather, Oliver Robert Batsel, a collector of exotic artifacts obsessed with acquiring items related to the long-defunct Empyreal Trading Co. Through letterpress, offset, and screenprint techniques, Batsel describes the collector’s life, preoccupation, and death in 2004, when – as she tells it – Hurricane Ivan washed his beachside Florida home, and his collection, into the sea. Since then, she has begun unearthing objects from the sand where his house stood. “Truth” and “accuracy” are slippery terms in Batsel’s work, but her ability to explore her own personal history while restoring books and objects that belonged to someone else creates a magnetic narrative. It captivates even more as the lines blur between childhood memory and figments of Batsel’s active and wondrous imagination. The art world – for good reason – lauds innovation and experimentation. But it took a while for me to gain the appreciation for reliability that I have now: reliable techniques, reliable supplies, and most importantly, reliable people. Good craftsmanship is made so much easier when you understand the properties and behaviors of your supplies as influenced by your techniques – will this brand of paper fold well into this book structure or will it crack? And if you can find a good collaborator whom you trust with the integrity of your work, that’s better than gold. On a continuum of inward reflection and outward expression, where do you and your work fall? A few years ago, I would have said I was firmly planted on the furthest reaches of outward expression. My personal feelings and history had nothing to do with my work, and I assumed no one would find those things interesting or provocative. But recently, my work has incorporated more inward reflection, and I think that the contextualization and partial fictionalization of my family’s history does lend it relevance to the world at large. It’s such a cliché answer, but there’s a reason every printmaker says it: the moment of pulling that print off the press for the first time and finally seeing the image that you’ve been working toward. No matter how well you think you’ve planned for an image or mentally visualized it, there’s always an element of surprise (for better or for worse) to actually pulling it. Revelation is my favorite aspect of exhibiting my work as well – watching people put threads of narrative together or realize something exciting about a story I’ve presented. 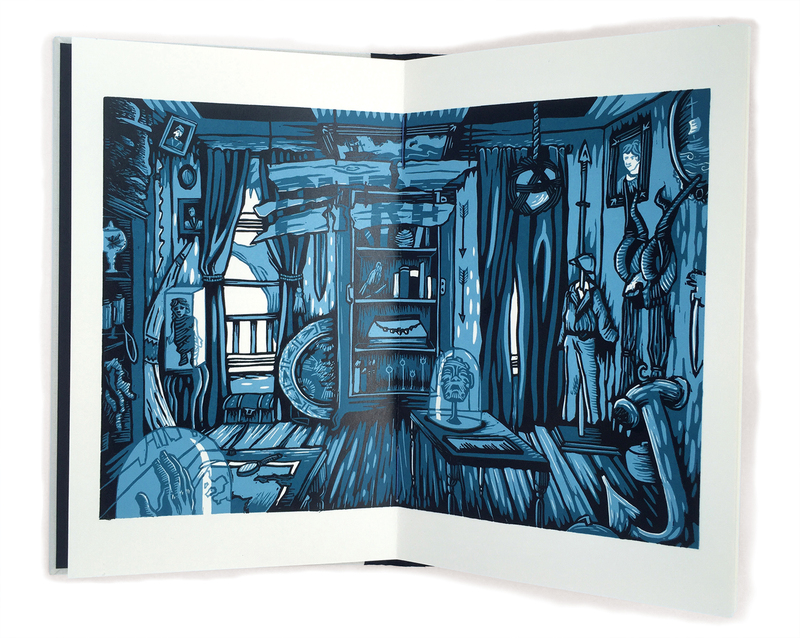 I can really only speak for the printmaking and book arts world, but I would hope that book arts gain recognition and popularity as a medium across all genres of art and craft. A book can be anything from a “white-wall gallery” presentation tool – a portfolio – to a highly conceptual object capable of representing any idea. Strangely enough, I would also hope for printmakers and book artists to learn more from scrapbookers and the Martha Stewart crowd. There are a lot of paper-crafting solutions and innovations out there that are being ignored because they never leave some suburban mom’s Pinterest board. For Ted Lott, building a home does not mean staying put. His pieces use familiar forms, often incorporating architectural framing from residential construction, but elude predictability. 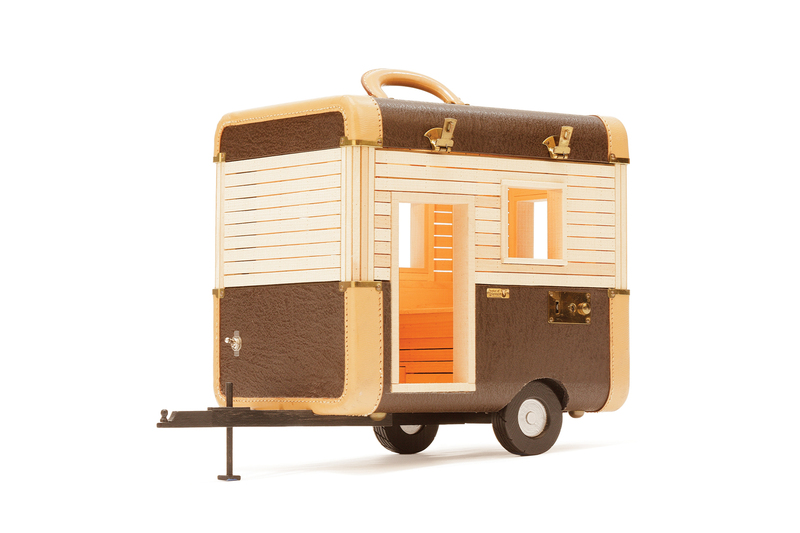 His Migration series, which began in 2014, makes homes of familiar luggage containers, and his Ambulation series (2015) features a different kind of travel: Houses sit perched atop long, spindly legs that, were they not made of wood, would appear ready to take a few steps elsewhere. For Lott, 37, movement is more than a passing theme. Working in series is something that I’m really loving. In the past, I’ve seldom done more than two to three pieces consecutively. Currently, with the Migration series, I’m on my 14th iteration, and each time the work takes on something new. On a continuum of inward reflection to outward expression, where do you and your work fall? One of the great things about architecture is that it is simultaneously inward- and outward facing. It “houses” our most intimate moments while projecting statements about who we are or who we would like to be. I tend to be a private person, yet I’ve chosen a life as an artist, which necessitates that I put myself out there. Likewise, I think my work is simultaneously contemplative and expressive. Working as an artist outside of academia, there’s a pressure to create work for the market, to find something that sells and stick with it. Taking risks on new work, or continuing the pursuit of an idea despite its lack of marketability, is both Shortlist Cooperstown, New York a financial risk and an artistic one. Staying true to myself without getting stuck in a rut is a dialogue I know well. There’s a point in each piece where the work starts becoming itself. This can happen either at the beginning of the processor toward the end, but it’s exciting to experience. My designs tend to evolve over the course of a project; it’s not unusual for me to alter a feature multiple times until I get it right. The process is cumulative: If you start out with a mistake or a half-assed bit, the problems multiply as you go forward. If you take the time to make it right, the goodness just keeps growing – usually. 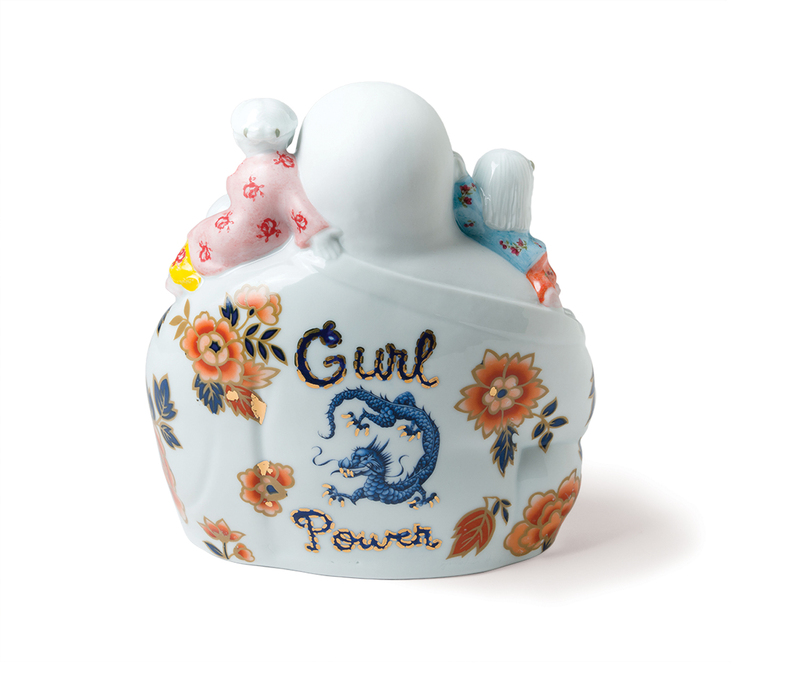 Joyful and irreverent, Gurl Power (2016) demonstrates Datchuk’s gift for combining ancient traditions and contemporary perspectives. For How to Make a Blue and White Bowl (2015), Datchuk bleached and dyed her hair in the manner of the ubiquitous tableware. 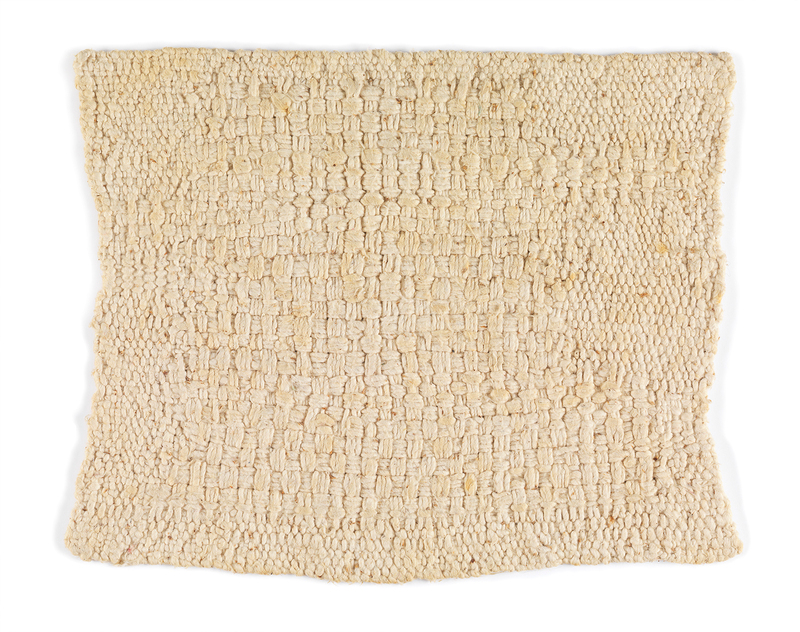 Sarah Parrish’s mission is to shed light on the revolutionary artists of the 1960s overlooked in art history, such as Sheila Hicks, who made Escribiendo con Textura (1960). Anna Mlasowsky revels in the new. The Tower (2015) was made using moldless pâte de verre, a technique she invented that allows for hand-forming glass. Anna Mlasowsky revels in the new. The Boat (2014) was made using moldless pâte de verre, a technique she invented that allows for hand-forming glass. A 2015 collaboration between Mlasowsky and Ellen (Jing) Xu resulted in a kaleidoscopic mirror work. Gerardo Monterrubio brings the messiness of real life to his ceramic work. Eduardo Arellano Felix (2009) is covered in images of turmoil. Gerardo Monterrubio brings the messiness of real life to his ceramic work. 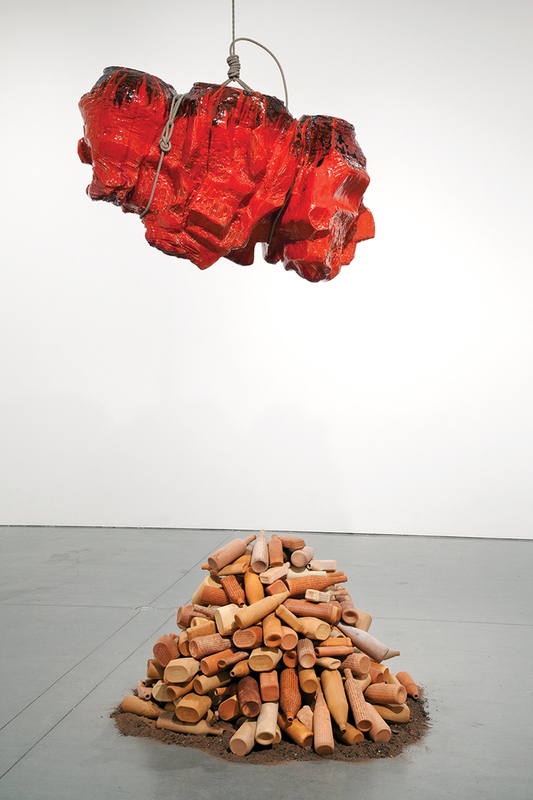 La Ranchera de Doña Marcelina de Martinez (2013) depicts a pile of discarded bottles. Above it is El Corrido de Don Gustavo Martinez (2013). 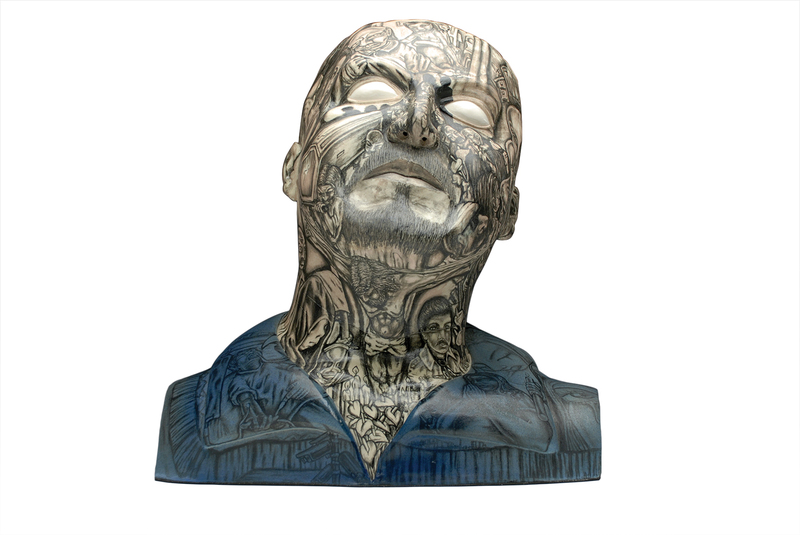 Gerardo Monterrubio brings the messiness of real life to his ceramic work. The interest in hardship extends to technique; Monterrubio hit Valemadrismo (2013) with a stick to add texture. Feel free to judge Hannah Batsel’s hand-bound books by their covers. Out of the Dark/Into the Water (2016) can be flipped and read in either direction, with each side leading up to a stunning centerfold. 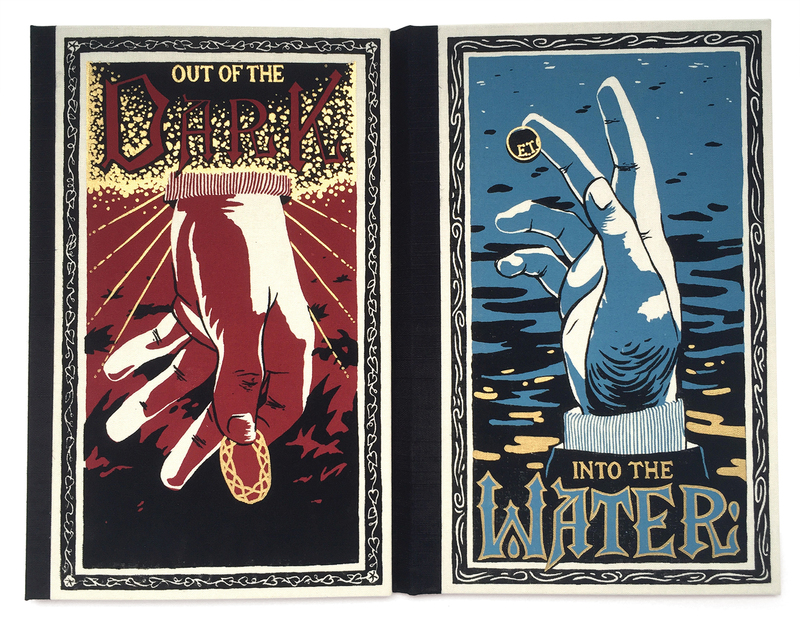 Out of the Dark/Into the Water (2016) can be flipped and read in either direction, with each side leading up to a stunning centerfold. 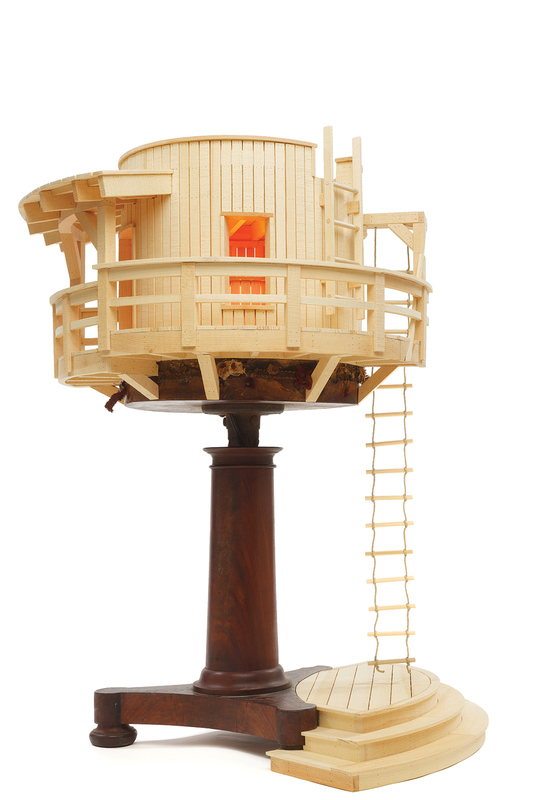 Ted Lott has started assembling his miniature structures – fantastic houses, odd modes of transportation – in series. Habitation #10 (2016) turns a piano stool into the support for an elevated residence. Migration #13 (2016) makes a trailer out of a suitcase.